The year was 1979, the ven-ue was the historic Oval cri-cket ground in London. Playing the final Test match — India trailing the hosts, England, by 0-1 - were set to score a mammoth 438 runs in 500 minutes to draw level in the series that had totally gone England’s way. Coming into the Test series after a dismal showing in the Prudential World Cup — where India had lost all their matches, including one to Sri Lanka who were virtually babes in the cricketing woods at that point in time, the Indian pride would have soared if they were to win the Test. While most Indians, including the players, were expecting the inevitable loss to the hosts, there was one cricketer who believed that India had a chance of winning when most would have been happy with a draw. Sunil Manohar Gavaskar put all his experience to use on a warm summers day to take his team to within a whisker of a win with an epic display that was judicious and attacking, bordering on almost perfect. Visions of India’s famous run chase against West Indies in the fourth innings at Port of Spain (1976) where Gavaskar and the ultimate stylist Gundappa Viswanath took the team to 403 runs to achieve the impossible almost arose with India needing 76 runs in 12 overs with nine wickets in hand. What should have been a heroic win for India turned out to be a cruel draw. Indian skipper Srinivas Venka-taraghavan turned around the middle order batting line up, sending the mercurial, but inexperienced Kapil Dev ahead of Viswan-ath at number 4. India ne-ver recovered from Kapil’s blob and the batsmen to follow went on the back foot. Post the absorbing mat-ch, critics from both countries panned the Indian captain for his sudden change in the batting order. Not only did it cost him his captaincy but the team lost a great opportunity to make up for a terrible season of cricket. John Arlott, the iconic cricket journalist, author and broa-dcaster summed up Gavaskar’s innings as historic and utterly brilliant, adding (in a typical English manner) that ‘perhaps’ India’s chance of a famous victory may have gone with the departure of the tiny titan. In many ways the recently concluded first Test match at Edgbaston (that India lost to England by a mere 31 runs) has parallels with the 1979 Oval game which India ‘should have’ won. The words ‘should have’ are the easiest to use when one critiques the game in hindsight. Sometimes, the easiest job in the world can be that of a critic who offers words of advice once the job (in this case game) is over. Virat Kohli, the current Indian skipper, proved his critics wrong with a belligerent performance with the bat — crossing his final frontier (as one had mentioned in this column a mon-th ago) as a batsman. His first innings score of 149, though not bl-emish less, was a workman like effort carved with solidity. What we saw was not Kohli the artist but as a hard working craftsman building an edifice brick by brick while the foundation was caving around him. It was a ‘taking two steps forward and one step behind’ situation for the Delhiite who kept losing partners in a typical Indian scenario we keep seeing when India faces strong attacks abroad. 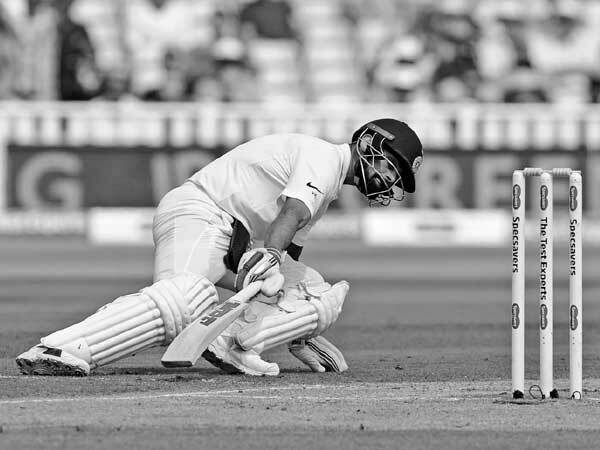 Like Gavaskar at the Oval, Kohli must have felt a deep stab of hurt not to see a single Indian top order batsman take the onus and grind his way to runs in a difficult situation. The comparisons between the two maestros (Kohli can certainly be called one after his singular effort at Edgbaston) end here. Gavaskar, at Oval, was just the key batsman; Kohli is also the captain. Former England captain, Nasser Hussain, an astute judge of the game, put forward his post-match perspective saying ‘Kohli was phenomenal in this game and deserved to be on the winning side for the way he played with the tail.’ With the bouquet came the brickbat where Hussain also put responsibility for the team’s loss on Kohli when the Indian skipper took Ravichandran Ashwin off the attack, allowing Sam Curran to add crucial runs in the company of Adil Rashid and Stuart Broad. Kohli’s dropping of Cheteshwar Pujara has also come under fire as has his ‘gut-feel’ to stay with Hardik Pandya instead of mystery man Kuldeep Yadav. Decisions such as these are always tough to explain once the match is over and if one happens to be on the losing side. In hindsight, had India won the Test, would there be egg on the face of Ed Smith, England's chief selector, for thrusting Adil Rashid instead of all rounder Moeen Ali? The loss by 31 runs goes to show that India ran England real close. A big factor was the fact that the visitors did not get enough red ball ‘match practice’ as pointed out by Gavaskar. With just one practice match (in the longer format of the game) against Essex, the Indian bowling attack performed creditably with off spinner Ashwin and pacer Ishant Sharma shining with the red cherry. Not many critics have given Kohli his due of cleverly using Ashwin early in each innings and his judicious handling of Ishant, who brought India back at a crucial juncture of the game. A loss, unfortunately, negates all the good work done by the captain notwit-hstanding his own excellent performance. With two marvellous innings (149 and 51) Kohli has buried the ghosts from his previous tour of England and one can finally say he has come of age as a batsman. With four more Test matches to go, will we see the dapper and most valuable player of the Indian team coming of age as a captain?